"The card is 30 years old this year, which means that I have an excuse to dig into the history of it. The incredibly dumb, incredibly ‘80s history of a baseball card with a swear word on it. One of the worst ones! Ripken talked to Darren Rovell about it a decade ago, but he’s not a fan of being associated with it." The question is, who wrote it on there? Has that ever been determined. Since nowadays we seem to want to blame everything on either Brady or Rick Dempsey, and t he Dipper wasn't with the team in 1988-89, I believe that Brady Anderson must be the most likely suspect. Ripken himself said he was surprised it got past the "editors". Could it have been a "conspiracy" to sell cards? First they airbrushed it and then they brought it back to reduce the uniqueness. wtf? But, I love the controversy! I never actually had this card growing up. Which feels like a dent in my otherwise very solid Orioles fanhood. 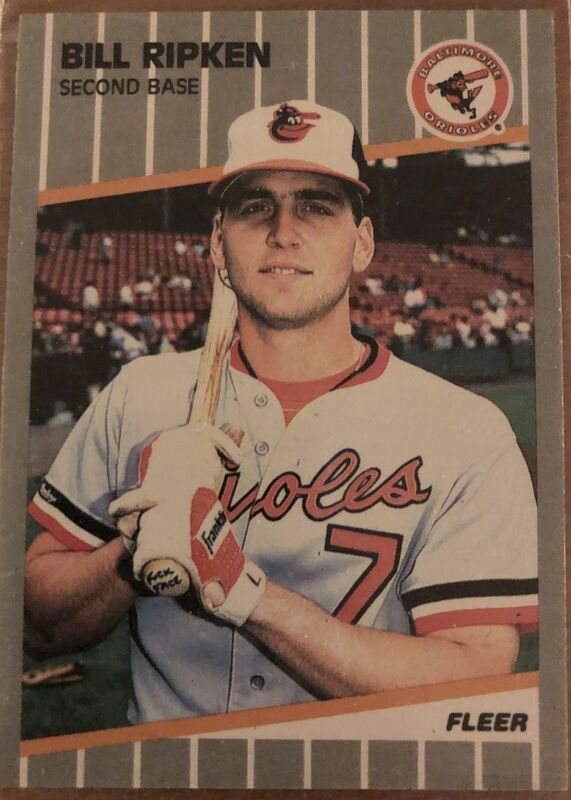 I feel like if you were growing up at this time and were an Orioles fan (or just collected cards in general) you HAD to have this card, but I grew up collecting Topps for a long time before branching out into other brands. I think I wound up getting an edited version of it but don't know where it is. So maybe when I get some extra cash I'll buy a few unopened packs (they're dirt cheap) and see if I can pull an unedited one. On the knob of the bat. That almost something like a brother would lovingly do to his younger brother. Cal would be my first guess. I suspect, if the culprit has not come to surface by now, it will be taken to the grave by those involved. Yup, I’d do that sort of thing to my brother. All in good fun. Me too, so for me its easy to see Jr doing this, and seeing if Billy got the wrath of Daddy along the way. I never heard Billy talk about it, but I always figured he did it. Pretty sure I had this card as a kid or at least knew someone that did. So if I did have it, I didnt hold onto it. "I have no idea where that bat is today. If I were to guess, I would say it probably got lost after someone used it in a game. Probably a guy like Brady Anderson because he choked up so he could use a heavier bat. Fleer sent me some of the cards out of the goodness of their heart. I autographed them and used them for my gifts to my groomsman in my wedding (which took place that offseason). I figured, at the time, it was better than giving them a set of cufflinks. I think I devalued the cards by signing them though. Billy said he wrote that to tell his bat apart from others in BP. Not sure if i believe that. I only quoted the above part because he mentions Brady might have it today lol.